"British House of Commons" redirects here. For the House of Commons 1707–1800, see House of Commons of Great Britain. For other bodies in British history and abroad, see House of Commons. Recommendations on how constituencies should be redistricted is carried out by the four Boundary Commissions, one for each of the constituent countries, but Parliament has final say on the boundaries. The House of Commons, officially the Honourable the Commons of the United Kingdom of Great Britain and Northern Ireland in Parliament assembled, is the lower house of the Parliament of the United Kingdom. Like the upper house, the House of Lords, it meets in the Palace of Westminster. Owing to shortage of space, its office accommodation extends into Portcullis House. The Commons is an elected body consisting of 650 members known as Members of Parliament (MPs). Members are elected to represent constituencies by the first-past-the-post system and hold their seats until Parliament is dissolved. The House of Commons of England started to evolve in the 13th and 14th centuries. It became the House of Commons of Great Britain after the political union with Scotland in 1707, and assumed the title of "House of Commons of Great Britain and Ireland" after the political union with Ireland at the start of the 19th century. The "United Kingdom" referred to was the United Kingdom of Great Britain and Ireland from 1800, and became the United Kingdom of Great Britain and Northern Ireland after the independence of the Irish Free State in 1922. Accordingly, the House of Commons assumed its current title. Under the Parliament Act 1911, the Lords' power to reject legislation was reduced to a delaying power. The Government is solely responsible to the House of Commons and the Prime Minister stays in office only as long as she or he retains the confidence of a majority of the Commons. Although it does not formally elect the prime minister, the position of the parties in the House of Commons is of overriding importance. By convention, the prime minister is answerable to, and must maintain the support of, the House of Commons. Thus, whenever the office of prime minister falls vacant, the Sovereign appoints the person who has the support of the House, or who is most likely to command the support of the House—normally the leader of the largest party in the Commons, while the leader of the second-largest party becomes the Leader of the Opposition. Since 1963, by convention, the prime minister is always a member of the House of Commons, rather than the House of Lords. The Commons may indicate its lack of support for the Government by rejecting a motion of confidence or by passing a motion of no confidence. Confidence and no confidence motions are phrased explicitly, for instance: "That this House has no confidence in Her Majesty's Government." Many other motions were until recent decades considered confidence issues, even though not explicitly phrased as such: in particular, important bills that were part of the Government's agenda. The annual Budget is still considered a matter of confidence. When a Government has lost the confidence of the House of Commons, the prime minister is obliged either to resign, making way for another MP who can command confidence, or to request the monarch to dissolve Parliament, thereby precipitating a general election. Parliament normally sits for a maximum term of five years. Subject to that limit, the prime minister could formerly choose the timing of the dissolution of parliament, with the permission of the Monarch. However, since the Fixed-Term Parliaments Act 2011, terms are now a fixed five years, and an early general election is brought about by a two-thirds majority in favour of a motion for a dissolution, or by a vote of no confidence that is not followed within fourteen days by a vote of confidence (which may be for confidence in the same government or in a different one). By this second mechanism, the UK's government can change its political composition without an intervening general election. Only four of the eight last Prime Ministers have attained office as the immediate result of a general election; the others have gained office upon the resignation of a Prime Minister of their own party. The latter four were Jim Callaghan, John Major, Gordon Brown and the current Prime Minister Theresa May; these four inherited the office from Harold Wilson, Margaret Thatcher, Tony Blair and David Cameron respectively. In such circumstances there may not even have been an internal party leadership election, as the new leader may be chosen by acclaim, having no electoral rival (as in the case of both Brown and May). A prime minister will resign after party defeat at an election if unable to lead a coalition, or obtain a confidence and supply arrangement. She or he may also resign after a motion of no confidence or for health reasons. In such cases, the premiership goes to whoever can command a majority in the House; unless there is a hung parliament and a coalition is formed, this will by convention be the new leader of the resignee's party. It has become the practice to write the constitution of major UK political parties to provide a set way in which to appoint a new leader. Until 1965, the Conservative Party had no fixed mechanism for this; when in 1957 Anthony Eden resigned as PM without recommending a successor, it was unable to nominate one. It fell to the Queen to appoint Harold Macmillan as the new prime minister, after taking the consensus of cabinet ministers. By convention, ministers are members of the House of Commons or House of Lords. A handful have been appointed who were outside Parliament, but in most cases they then entered Parliament in a by-election or by receiving a peerage (being made a life peer). Exceptions include Peter Mandelson, appointed Secretary of State for Business, Enterprise and Regulatory Reform in October 2008 before his peerage. Since 1902, all prime ministers have been members of the Commons; the sole exception was during the long summer recess in 1963: the 14th Earl of Home disclaimed his peerage (under a new mechanism which remains in force) three days after becoming prime minister, thereby becoming Sir Alec Douglas-Home. The new session of Parliament was delayed to await the outcome of his by-election, which happened to be under way due to a recent death. As anticipated, he won that election, which was for the highest-majority seat in Scotland among his party; otherwise he would have been constitutionally obliged to resign. Few major cabinet positions (except Lord Privy Seal, Lord Chancellor and Leader of the House of Lords) have been filled by a peer in recent times. Notable exceptions are Peter Carington, 6th Lord Carrington, who served as Foreign Secretary from 1979 to 1982, David Young, Lord Young of Graffham, who was appointed Employment Secretary in 1985, Lord Mandelson, who served as Business Secretary, Lord Adonis, who served as Transport Secretary, and Baroness Amos, who served as International Development Secretary. The elected status of members of the Commons (as opposed to the unelected Lords) and their direct accountability to that House, together with empowerment and transparency, ensures ministerial accountability. Responsible government is an international constitutional paradigm. The prime minister chooses the ministers, and may decide to remove them at any time, although the appointments and dismissals are formally made by the Sovereign. The House of Commons formally scrutinises the Government through its Committees and Prime Minister's Questions, when members ask questions of the prime minister; the House gives other opportunities to question other cabinet ministers. Prime Minister's Questions occur weekly, normally for half an hour each Wednesday. Questions must relate to the responding minister's official government activities, not to his or her activities as a party leader or as a private Member of Parliament. Customarily, members of the Government party/coalition and members of the Opposition alternate when asking questions. Members may also make inquiries in writing. In practice, this scrutiny can be fairly weak. Since the first-past-the-post electoral system is employed, the governing party often enjoys a large majority in the Commons, and ministers and departments practise defensive government, outsourcing key work to third parties. If the government has a large majority, it has no need or incentive to compromise with other parties, apart from working in Select Committees for personal acclaim. Major modern British political parties tend to be so tightly orchestrated that their MPs have little scope for free action. A large minority of ruling party MPs are paid members of the Government. Since 1900 the Government has lost confidence motions three times — twice in 1924, and once in 1979. However, the threat of rebellions by their own party's backbench MPs often forces governments to make concessions (under the Coalition, over foundation hospitals and under Labour over top-up fees and compensation for failed company pension schemes). Occasionally Government bills are defeated by backbench rebellions (Terrorism Act 2006). However, the scrutiny provided by the Select Committees is more serious. The House of Commons technically retains the power to impeach Ministers of the Crown (or any other subject, even if not a public officer) for their crimes. Impeachments are tried by the House of Lords, where a simple majority is necessary to convict. But this power has fallen into disuse: the House of Commons exercises its checks on the government through other means, such as no confidence motions; the last impeachment was that of Henry Dundas, 1st Viscount Melville in 1806. Bills may be introduced in either house, though bills of importance generally originate in the House of Commons. The supremacy of the Commons in legislative matters is assured by the Parliament Acts, under which certain types of bills may be presented to the Queen for Royal Assent without the consent of the House of Lords. The Lords may not delay a money bill (a bill that, in the view of the Speaker of the House of Commons, solely concerns national taxation or public funds) for more than one month. Moreover, the Lords may not delay most other public bills for more than two parliamentary sessions, or one calendar year. These provisions, however, only apply to public bills that originate in the House of Commons. Moreover, a bill that seeks to extend a parliamentary term beyond five years requires the consent of the House of Lords. By a custom that prevailed even before the Parliament Acts, only the House of Commons may originate bills concerning taxation or Supply. Furthermore, supply bills passed by the House of Commons are immune to amendments in the House of Lords. In addition, the House of Lords is barred from amending a bill so as to insert a taxation or supply-related provision, but the House of Commons often waives its privileges and allows the Lords to make amendments with financial implications. Under a separate convention, known as the Salisbury Convention, the House of Lords does not seek to oppose legislation promised in the Government's election manifesto. Hence, as the power of the House of Lords has been severely curtailed by statute and by practice, the House of Commons is clearly the more powerful chamber of Parliament. The British Parliament of today largely descends, in practice, from the Parliament of England, although the 1706 Treaty of Union, and the Acts of Union that ratified the Treaty, created a new Parliament of Great Britain to replace the Parliament of England and the Parliament of Scotland, with the addition of 45 MPs and sixteen Peers to represent Scotland. Later still the Acts of Union 1800 brought about the abolition of the Parliament of Ireland and enlarged the Commons at Westminster with 100 Irish members, creating the Parliament of the United Kingdom of Great Britain and Ireland. The current Commons' layout is influenced by the use of the original St. Stephen's Chapel in the Palace of Westminster. William Pitt the Younger addressing the Commons on the outbreak of the war with France (1793); painting by Anton Hickel. The House of Commons in the early 19th century by Augustus Pugin and Thomas Rowlandson. The old Chamber of the House of Commons built by Sir Charles Barry was destroyed by German bombs during the Second World War. The essential features of Barry's design were preserved when the Chamber was rebuilt. In 1908, the Liberal Government under Asquith introduced a number of social welfare programmes, which, together with an expensive arms race, forced the Government to seek higher taxes. In 1909, the Chancellor of the Exchequer, David Lloyd George, introduced the "People's Budget", which proposed a new tax targeting wealthy landowners. This measure failed in the heavily Conservative House of Lords, and the government resigned. The resulting general election returned a hung parliament, but Asquith remained prime minister with the support of the smaller parties. Asquith then proposed that the powers of the Lords be severely curtailed. After a further election in December 1910, the Asquith Government secured the passage of a bill to curtail the powers of the House of Lords after threatening to flood the House with 500 new Liberal peers to ensure the passage of the bill. Thus the Parliament Act 1911 came into effect, destroying the legislative equality of the two Houses of Parliament. The House of Lords was permitted only to delay most legislation, for a maximum of three parliamentary sessions or two calendar years (reduced to two sessions or one year by the Parliament Act 1949). Since the passage of these Acts, the House of Commons has become the dominant branch of Parliament, both in theory and in practice. In 1918, women over 30 who owned property were given the right to vote, as were men over 21 who did not own property, quickly followed by the passage of a law enabling women to be eligible for election as members of parliament at the younger age of 21. The only woman to be elected that year was an Irish Sinn Féin candidate, Constance Markievicz, who therefore became the first woman to be an MP. However, owing to Sinn Féin's policy of abstention from Westminster, she never took her seat. Women were given equal voting status as men in 1928, and with effect from the General Election in 1950, various forms of plural voting (i.e. some individuals had the right to vote in more than one constituency in the same election), including University constituencies, were abolished. Since 1950, each Member of Parliament has represented a single constituency (also known as a seat). There remains a technical distinction between county and borough constituencies; its only effects are the amount of money candidates are allowed to spend during campaigns and the rank of the local authority co-opted Returning Officer who presides over the count. Geographic boundaries are determined by four permanent and independent Boundary Commissions, one each for England, Wales, Scotland, and Northern Ireland. The commissions conduct general reviews of electoral boundaries once every 8 to 12 years, and interim reviews. In drawing boundaries, they are required to prefer local government boundaries, but may deviate from these to prevent great disparities in electorate, as such disparities are given the formal term malapportionment. The proposals of the Boundary Commissions are subject to parliamentary approval, but may not be amended. After their next Periodic Reviews, the Boundary Commissions will be absorbed into the Electoral Commission, which was established in 2000. As of 2017, the UK is divided into 650 constituencies, with 533 in England, 40 in Wales, 59 in Scotland, and 18 in Northern Ireland. General elections occur whenever Parliament is dissolved. The timing of the dissolution was normally chosen by the Prime Minister (see relationship with the Government above); however, as a result of the Fixed-term Parliaments Act 2011, Parliamentary terms are now fixed at five years, except in the event of the House of Commons sustaining a vote of no confidence or passing an "early election" motion, the latter having to be passed by a two-thirds majority. The first use of this procedure was in April 2017, when MPs voted in favour of Theresa May's call for a snap election to be held that June. A candidate for a seat must submit nomination papers signed by ten registered voters from that area, and pay £500, which is refunded if the candidate wins at least five per cent of the vote. Such a deposit (see deposit (politics)) seeks to discourage frivolity and very long ballot papers which would cause vote splitting (and arguably voter confusion). Each constituency can be called a seat as it was in 1885, as it returns one member, using the first-past-the-post electoral system, under which the candidate with a "plurality of" votes wins, that is greatest number of votes. Minors (that is, anyone under the age of 18), members of the House of Lords, prisoners, and insane persons are not qualified to become members of the House of Commons. To vote, one must be a UK resident and a British citizen, or a citizen of a British overseas territory, of the Republic of Ireland, or of a member of the Commonwealth of Nations. British citizens living abroad are allowed to vote for 15 years after leaving. It is a criminal offence for a person to vote in the ballot of more than one seat which is vacant at any election. This has not always been the case as before 1948 plural voting was permitted as voters qualified by home ownership or residence and could vote under both entitlements simultaneously. The term "Member of Parliament" by modern convention means members of the House of Commons. These members may, and almost invariably, use the post-nominal letters "MP". The annual salary of each member is £74,962, effective from 1 April 2016. Members may also receive additional salaries for other offices they hold (for instance, the Speakership). Most members also claim for various office expenses (staff costs, postage, travelling, etc.) and, in the case of non-London-area members, for the costs of maintaining a home in the capital. There are numerous qualifications that apply to Members of Parliament. One must be aged at least 18 (the minimum age was 21 until s.17 of the Electoral Administration Act 2006 came into force), and must be a citizen of the United Kingdom, of a British overseas territory, of the Republic of Ireland, or of a member state of the Commonwealth of Nations. These restrictions were introduced by the British Nationality Act 1981, but were previously far more stringent: under the Act of Settlement 1701, only natural-born subjects were qualified. Members of the House of Lords may not serve in the House of Commons, or even vote in parliamentary elections (just as the Queen does not vote); however, they are permitted to sit in the chamber during debates (unlike the Queen, who cannot enter the chamber). A person may not sit in the Commons if she or he is the subject of a Bankruptcy Restrictions Order (applicable in England and Wales only), or if she or he is adjudged bankrupt (in Northern Ireland), or if his or her estate is sequestered (in Scotland). Previously, MPs detained under the Mental Health Act 1983 for six months or more would have their seat vacated if two specialists reported to the Speaker that the member was suffering from a mental disorder. However, this disqualification was removed by the Mental Health (Discrimination) Act 2013. There also exists a common law precedent from the 18th century that the deaf and dumb are ineligible to sit in the Lower House; this precedent, however, has not been tested in recent years. Anyone found guilty of high treason may not sit in Parliament until she or he has either completed the term of imprisonment or received a full pardon from the Crown. Moreover, anyone serving a prison sentence of one year or more is ineligible. Finally, the Representation of the People Act 1983 disqualifies for ten years those found guilty of certain election-related offences. Several other disqualifications are codified in the House of Commons Disqualification Act 1975: holders of high judicial offices, civil servants, members of the regular armed forces, members of foreign legislatures (excluding the Republic of Ireland and Commonwealth countries), and holders of several Crown offices. Ministers, even though they are paid officers of the Crown, are not disqualified. The rule that precludes certain Crown officers from serving in the House of Commons is used to circumvent a resolution adopted by the House of Commons in 1623, under which members are not permitted to resign their seats. In practice, however, they always can. Should a member wish to resign from the Commons, she or he may request appointment to one of two ceremonial Crown offices: that of Crown Steward and Bailiff of the Chiltern Hundreds, or that of Crown Steward and Bailiff of the Manor of Northstead. These offices are sinecures (that is, they involve no actual duties); they exist solely to permit the "resignation" of members of the House of Commons. The Chancellor of the Exchequer is responsible for making the appointment, and, by convention, never refuses to do so when asked by a member who desires to leave the House of Commons. Whilst presiding, the Speaker or Deputy Speaker wears ceremonial dress. The presiding officer may also wear a wig, but this tradition was abandoned by Speaker Betty Boothroyd. Her successor, Michael Martin, also did not wear a wig while in the chamber. The current Speaker, John Bercow, has chosen to wear a gown over a lounge suit, a decision that has sparked much debate and opposition. The Speaker or deputy presides from a chair at the front of the House. This chair was designed by Augustus Pugin, who initially built a prototype of the chair at King Edward's School, Birmingham: that chair is called Sapientia and is where the chief master sits. The Speaker is also chairman of the House of Commons Commission, which oversees the running of the House, and controls debates by calling on members to speak. A member who believes that a rule (or Standing Order) has been breached may raise a "point of order", on which the Speaker makes a ruling that is not subject to any appeal. The Speaker may discipline members who fail to observe the rules of the House. Thus, the Speaker is far more powerful than his or her Lords counterpart, the Lord Speaker, who has no disciplinary powers. Customarily, the Speaker and the deputies are non-partisan; they do not vote (with the notable exception of tied votes, where the Speaker votes in accordance with Denison's rule), or participate in the affairs of any political party. By convention, a Speaker seeking re-election to parliament is not opposed in his or her constituency by any of the major parties. The lack of partisanship continues even after the Speaker leaves the House of Commons. The Clerk of the House is both the House's chief adviser on matters of procedure and chief executive of the House of Commons. She or he is a permanent official, not a member of the House itself. The Clerk advises the Speaker on the rules and procedure of the House, signs orders and official communications, and signs and endorses bills. The Clerk also chairs the Board of Management, which consists of the heads of the six departments of the House. The Clerk's deputy is known as the Clerk Assistant. Another officer of the House is the Serjeant-at-Arms, whose duties include the maintenance of law, order, and security on the House's premises. The Serjeant-at-Arms carries the ceremonial mace, a symbol of the authority of the Crown and of the House of Commons, into the House each day in front of the Speaker, and the Mace is laid upon the Table of the House during sittings. The Librarian is head of the House of Commons Library, the House's research and information arm. Like the Lords, the Commons meets in the Palace of Westminster in London. The Commons chamber is small and modestly decorated in green, in contrast to the large, lavishly furnished red Lords chamber. There are benches on two sides of the chamber, divided by a centre aisle. This arrangement reflects the design of St Stephen's Chapel, which served as the home of the House of Commons until destroyed by fire in 1834. The Speaker's chair is at one end of the Chamber; in front of it, is the Table of the House, on which the Mace rests. The Clerks sit at one end of the Table, close to the Speaker so that they may advise him or her on procedure when necessary. Members of the Government sit on the benches on the Speaker's right, whilst members of the Opposition occupy the benches on the Speaker's left. In front of each set of benches a red line is drawn, which members are traditionally not allowed to cross during debates. Government ministers and the leader of the Opposition and the Shadow Cabinet sit on the front rows, and are known as frontbenchers. Other members of parliament, in contrast, are known as backbenchers. Not all Members of Parliament can fit into the Chamber at the same time, as it only has space to seat approximately two thirds of the Members. According to Robert Rogers, former Clerk of the House of Commons and Chief Executive, a figure of 427 seats is an average or a finger-in-the-wind estimate. Members who arrive late must stand near the entrance of the House if they wish to listen to debates. Sittings in the Chamber are held each day from Monday to Thursday, and also on some Fridays. During times of national emergency, the House may also sit at weekends. Public debates are recorded and archived in Hansard. The post war redesign of the House in 1950 included microphones, and debates were allowed to be broadcast by radio in 1975. Since 1989, they have also been broadcast on television, which is now handled by BBC Parliament. Sessions of the House of Commons have sometimes been disrupted by angry protesters throwing objects into the Chamber from the galleries—items thrown include leaflets, manure, flour by the group Fathers 4 Justice, and a canister of chlorobenzylidene malonitrile (tear gas). Even members have been known to disturb proceedings of the House. For instance, in 1976, Conservative MP Michael Heseltine seized and brandished the Mace of the House during a heated debate. However, perhaps the most famous disruption of the House of Commons was caused by Charles I, who entered the Commons Chamber in 1642 with an armed force to arrest five members for high treason. This action was deemed a breach of the privilege of the House, and has given rise to the tradition that the monarch does not set foot in the House of Commons. Each year, the parliamentary session begins with the State Opening of Parliament, a ceremony in the Lords Chamber during which the Sovereign, in the presence of Members of both Houses, delivers an address outlining the Government's legislative agenda. The Gentleman Usher of the Black Rod (a Lords official) is responsible for summoning the Commons to the Lords Chamber. When he arrives to deliver his summons, the doors of the Commons Chamber are traditionally slammed shut in his face, symbolising the right of the Lower House to debate without interference. He then knocks on the door three times with his Black Rod, and only then is granted admittance, where he informs the MPs that the Monarch awaits them, after which they proceed to the House of Lords for the Queen's Speech. During debates, Members may speak only if called upon by the Speaker (or a Deputy Speaker, if the Speaker is not presiding). Traditionally, the presiding officer alternates between calling Members from the Government and Opposition. The Prime Minister, the Leader of the Opposition, and other leaders from both sides are normally given priority. All Privy Counsellors used to be granted priority; however, the modernisation of Commons procedure in 1998 led to the abolition of this tradition. Speeches are addressed to the presiding officer, using the words "Mr Speaker", "Madam Speaker", "Mr Deputy Speaker", or "Madam Deputy Speaker". Only the presiding officer may be directly addressed in debate; other members must be referred to in the third person. Traditionally, members do not refer to each other by name, but by constituency, using forms such as "the Honourable Member for [constituency]", or, in the case of Privy Counsellors, "the Right Honourable Member for [constituency]". Members of the same party (or allied parties or groups) refer to each other as "my (Right) Honourable friend". (A member of the Armed Forces used to be called "the Honourable and Gallant Member", a barrister "the Honourable and Learned Member", and a woman "the Honourable Lady the Member".) This may not always be the case during the actual oral delivery, when it might be difficult for a member to remember another member's exact constituency, but it is invariably followed in the transcript entered in the Hansard. The Speaker enforces the rules of the House and may warn and punish members who deviate from them. Disregarding the Speaker's instructions is considered a breach of the rules of the House and may result in the suspension of the offender from the House. In the case of grave disorder, the Speaker may adjourn the House without taking a vote. The Standing Orders of the House of Commons do not establish any formal time limits for debates. The Speaker may, however, order a member who persists in making a tediously repetitive or irrelevant speech to stop speaking. The time set aside for debate on a particular motion is, however, often limited by informal agreements between the parties. Debate may also be restricted by the passage of "Allocation of Time Motions", which are more commonly known as "Guillotine Motions". Alternatively, the House may put an immediate end to debate by passing a motion to invoke Closure. The Speaker is allowed to deny the motion if she or he believes that it infringes upon the rights of the minority. Today, bills are scheduled according to a Timetable Motion, which the whole House agrees in advance, negating the use of a guillotine. Once the division concludes, the tellers provide the results to the presiding officer, who then announces them to the House. If there is an equality of votes, the Speaker or Deputy Speaker has a casting vote. Traditionally, this casting vote is exercised to allow further debate, if this is possible, or otherwise to avoid a decision being taken without a majority (e.g. voting 'No' to a motion or the third reading of a bill). Ties rarely occur—more than 25 years passed between the last two ones in July 1993 and April 2019. The quorum of the House of Commons is 40 members for any vote, including the Speaker and four tellers. If fewer than 40 members have participated, the division is invalid. Formerly, if a member sought to raise a point of order during a division, suggesting that some of the rules governing parliamentary procedure are violated, he was required to wear a hat, thereby signalling that he was not engaging in debate. Collapsible top hats were kept in the Chamber just for this purpose. This custom was discontinued in 1998. The outcome of most votes is largely known beforehand, since political parties normally instruct members on how to vote. A party normally entrusts some members of parliament, known as whips, with the task of ensuring that all party members vote as desired. Members of Parliament do not tend to vote against such instructions, since those who do so jeopardise promotion, or may be deselected as party candidates for future elections. Ministers, junior ministers and parliamentary private secretaries who vote against the whips' instructions usually resign. Thus, the independence of Members of Parliament tends to be low, although "backbench rebellions" by members discontent with their party's policies do occur. A member is also traditionally allowed some leeway if the particular interests of his constituency are adversely affected. In some circumstances, however, parties announce "free votes", allowing members to vote as they please. Votes relating to issues of conscience such as abortion and capital punishment are typically free votes. The House of Commons also has several Departmental Select Committees. The membership of these bodies, like that of the Standing Committees, reflects the strength of the parties. Each committee elects its own chairman. The primary function of a Departmental Select Committee is to scrutinise and investigate the activities of a particular government department. To fulfil these aims, it is permitted to hold hearings and collect evidence. Bills may be referred to Departmental Select Committees, but such a procedure is seldom used. A separate type of Select Committee is the Domestic Committee. Domestic Committees oversee the administration of the House and the services provided to Members. Other committees of the House of Commons include Joint Committees (which also include members of the House of Lords), the Committee on Standards and Privileges (which considers questions of parliamentary privilege, as well as matters relating to the conduct of the members), and the Committee of Selection (which determines the membership of other committees). For full details of changes during the 57th Parliament, see Defections and suspensions and By-elections. In addition to the parties listed in the table above, the Co-operative Party is represented in the House of Commons by 33 Labour MPs sitting with the Labour Co-operative designation. "Members elected" refers to the composition resulting from the election on 8 June 2017, but note that the confidence and supply arrangement (referred to in the final row as C&S) was only reached on 26 June. 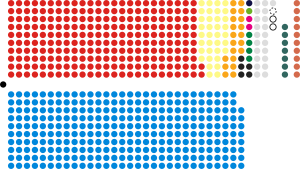 The "voting total" is the effective size of the House excluding vacancies, suspensions, and certain members (currently eleven): the Speaker (originally Conservative), three Deputy Speakers (two Labour and one Conservative), by current convention the speaker and his deputies only have a tie-breaking vote constrained by conventions, and seven abstentionist members (Sinn Féin). This leaves party voting totals as follows: Con 312, Lab 244, SF 0, Speaker 0, Deputy Speakers 0. The symbol used by the Commons consists of a portcullis topped by St Edward's Crown. The portcullis has been one of the Royal Badges of England since the accession of the Tudors in the 15th century, and was a favourite symbol of King Henry VII. It was originally the badge of Beaufort, his mother's family; and a pun on the name Tudor, as in tu-door. The original badge was of gold, but nowadays is shown in various colours, predominantly green or black. In 1986, the British television production company Granada Television created a near-full size replica of the post-1950 House of Commons debating chamber at its studios in Manchester for use in its adaptation of the Jeffrey Archer novel First Among Equals. The set was highly convincing, and was retained after the production—since then, it has been used in nearly every British film and television production that has featured scenes set in the chamber. From 1988 until 1999 it was also one of the prominent attractions on the Granada Studios Tour, where visitors could watch actors performing mock political debates on the set. 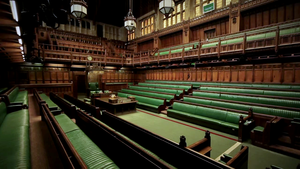 The major difference between the studio set and the real House of Commons Chamber is that the studio set has just four rows of seats on either side whereas the real Chamber has five. In 2002, the set was purchased by the scriptwriter Paul Abbott so that it could be used in his BBC drama serial State of Play. Abbott, a former Granada Television staff writer, bought it personally as the set would otherwise have been destroyed and he feared it would take too long to get the necessary money from the BBC. Abbott kept the set in storage in Oxford. The pre-1941 Chamber was recreated in Shepperton Studios for the Ridley Scott/Richard Loncraine 2002 biographical film on Churchill, The Gathering Storm. ^ Pollard, A.F. (1920). The Evolution of Parliament. Longmans. pp. 107–08. Not that the house of commons was ever that house of the common people which it is sometimes supposed to have been. For " commons " means " communes " ; and while " communes " have commonly been popular organizations, the term might in the thirteenth and fourteenth centuries be applied to any association or confederacy. ^ "The Commons Chamber in the 16th Century". Parliament of the United Kingdom. Retrieved 14 October 2011. ^ Rush, Michael (2005). Parliament Today. Manchester University Press. p. 141. ISBN 9780719057953. ^ "Women in parliament". BBC News. 31 October 2008. Retrieved 30 January 2009. ^ Nicholas Allen; Sarah Birch (5 February 2015). Ethics and Integrity in British Politics. Cambridge University Press. p. 145. ISBN 978-1-107-05050-1. ^ "Speaker quits 'for sake of unity'". BBC News. 19 May 2009. Retrieved 10 June 2017. ^ "Speaker Michael Martin resigns over MPs' expenses". The Daily Telegraph. 19 May 2009. Retrieved 10 June 2017. ^ "Fixed-term Parliaments Act". Legislation.gov.uk. Retrieved 15 April 2013. ^ Wilson, Peter (8 May 2010). "Archaic electoral biases must go". The Australian. Sydney, Australia: News Limited. Retrieved 9 May 2010. ^ "UK Parliament – Pay and expenses for MPs". Parliament.uk. Retrieved 14 April 2014. ^ Simeon, Sir John (1789). A Treatise on the Law of Elections: In All Its Branches – John Simeon – Google Books. Retrieved 8 April 2014. ^ "An insider's guide to the House of Commons". parliament.uk. 19 October 2012. Retrieved 1 September 2017. ^ "Strangers – Glossary page". Parliament.uk. Retrieved 25 March 2019. ^ "Hansard of the air". parliament.uk. Retrieved 1 December 2015. ^ "20 years of TV cameras in the Commons". BBC Politics. Retrieved 1 December 2015. ^ Samuel, Herbert (May 1935). "The Pageantry of Parliament". The Rotarian. 46 (5): 22. Retrieved 14 April 2015. ^ "Pairing – Glossary page – UK Parliament". Parliament.uk. 21 April 2010. Retrieved 28 December 2011. ^ "Current State of the Parties". UK Parliament. Retrieved 17 May 2018. ^ "Who we are". The Independent Group. Retrieved 26 February 2019. ^ "About the Party". Co-operative Party. Retrieved 22 February 2019. ^ Boothroyd, David. "House of Commons: Tied Divisions". United Kingdom Election Results. Retrieved 25 July 2018. ^ Fox-Davies, Arthur (1909). A Complete Guide to Heraldry. London: T.C. & E.C. Jack. ^ Abbott, Paul. Audio commentary on the DVD release of State of Play. BBC Worldwide. BBCDVD 1493. May, Erskine. (1896). Constitutional History of England since the Accession of George the Third, 11th ed. London: Longmans, Green and Co.
Mackenzie, K. R., "The English Parliament", (1950) Pelican Books. Raphael, D. D., Donald Limon, and W. R. McKay. (2004). Erskine May: Parliamentary Practice, 23rd ed. London: Butterworths Tolley. Wikimedia Commons has media related to House of Commons of the United Kingdom. "House of Commons collected news and commentary". The Guardian. 1 European Union law applies in the United Kingdom and Gibraltar. Following the invokation of Article 50, the United Kingdom is set to leave the European Union. A Great Repeal Bill has been proposed to incorporate all current European laws into British law. 2 "Bailiwick-wide" legislation passed in the States of Guernsey applies not only in Guernsey, but also in Alderney and Sark, with the consent of their governments.